It was a quick two game road trip for the Devils to close out the month of March…okay, so 10 hours to Virginia isn’t exactly quick. But it was a successful trip on the scoresheet, as Albany swept both games and stayed in the Eastern Conference playoff race. But it may have taken the loss of three forwards to injury to do so. Round 1 came Friday night, and featured a rematch of last Saturday’s 4-3 win in the Capital Region in net, Scott Wedgewood vs. Jason Labarbera. Joe Whitney would get things started on the right foot…er, skate…with his 19th goal 4 minutes into the game for a 1-0 lead. 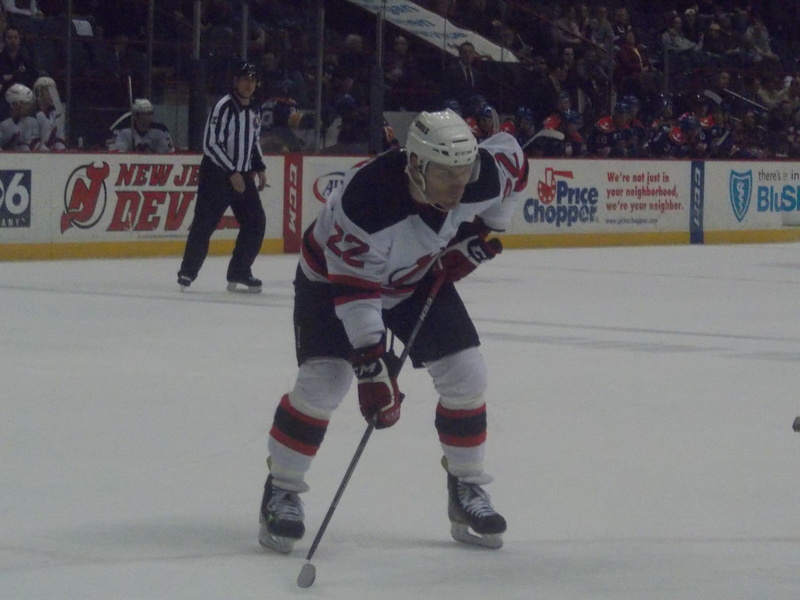 Former Devil Dave Steckel, now Norfolk’s captain, would tie things up with his 5th later in the period. The special teams play would continue its resurgence as of late, with another power play goal, this one off the stick of Raman Hrabarenka, as the second period was coming to an end, literally (the clock read .2 seconds). Scott Timmins would give the Devils an insurance goal with just under 8 minutes remaining for a 3-1 lead…or so we thought. Norfolk was not about to go away quietly, however…Max Friberg would cut the lead to 1 with under 4 minutes to go in regulation. Then with Labarbera pulled and a successful 6 on 4 penalty kill, Kevin Gagne managed to get the puck past Clemmensen with 1.8 seconds left to force overtime. Albany would get a test with Whitney off for a hooking call just as the 3 on 3 portion was set to begin. 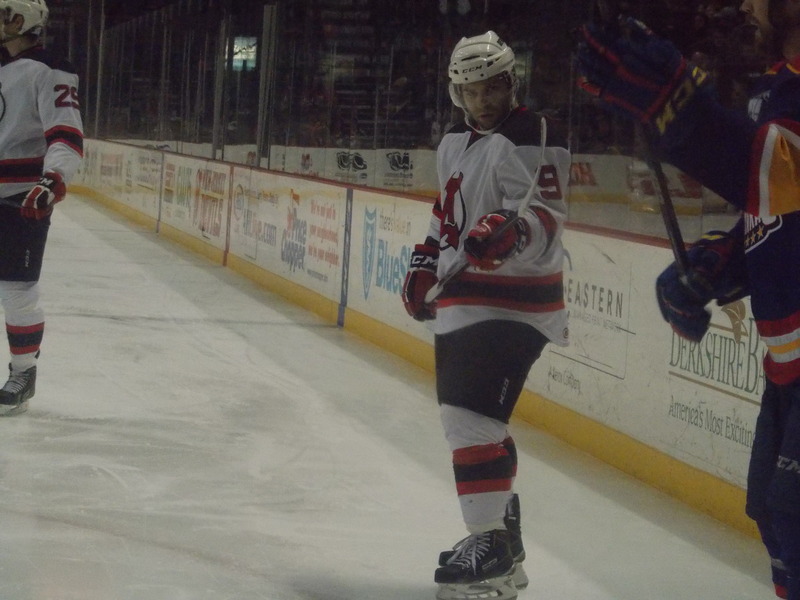 Not only did the Devils manage to kill it…Rod Pelley would pass the puck to Whitney as he was exiting the box, he broke away and scored the game winner with 21 seconds remaining in the extra frame to give Albany their third straight win. Wedgewood would pick up his 11th win with 29 saves. Whitney, Timmins, Pelley, and Seth Helgeson all contributed assists. A couple of lineup changes for the rematch on Saturday, as Scott Clemmensen drew the start in net and Alexandre Carrier took Graham Black’s place on the fourth line due to an apparent injury to the rookie. Things got off to a very chippy start as a hit on David Wohlberg would set the tone. After Ben Thomson stepped in and fought John Kurtz (who delivered the hit), Paul Thompson would score on the ensuing power play (only interference was called on Kurtz; Wohlberg would not return to the game) for a 1-0 Devil lead. As the second period was getting underway, Dan Kelly would put a clean hit on Stefan Noesen…and had to answer to Mike Sgarbossa with a bout of his own. The power play came through yet again a short time later, as Thompson would score his second with the man advantage for a 2-0 lead. Louis Leblanc would break up Clemmensen’s shutout bid and cut the lead in half a short time later. Then another hit, this time on Joe Whitney, courtesy of Josh Manson would leave the Devils without two more forwards: Whitney would leave the game favoring a leg, while Rod Pelley had to sit out most of the rest of the contest after fighting Manson. Two more near fight incidents involving Raman Hrabarenka and Tim Sestito would break out, but peace was finally restored for the third period. And Thompson would come through again, completing the hat trick (his second of the season) with 2:30 to go and finishing off a perfect road trip for the Devils. Clemmensen stopped 37 of 38 shots and picked up his 8th win. Mike Sislo would add two assists, while Whitney and Hrabarenka each had a helper. Matt Lorito would get his second pro point, assisting on Thompson’s third goal. The magic number to clinch a playoff spot stands at 25. Elimination number stands at 14. With 9 games left, this is going to go right to the end. Pop Quiz: With the final game in Norfolk on Saturday…what is Albany’s all time record in Virginia? The answer is upcoming. Or, line of the week. The top line of Joe Whitney (4 points before injury), Paul Thompson (hat trick) and Scott Timmins (2 points) came through once again. Maxime Clermont (Orlando): 19 GP, 9-6-14, 3.01 GAA, .899 Save Pct. Injury Update: We’ll have to wait and see on the statuses of Graham Black, David Wohlberg, and Joe Whitney after all 3 were injured in Norfolk. Reece Scarlett missed the weekend due to illness. Cam Janssen will be eligible to return Wednesday after serving his two game suspension. We have made it to April. The homestretch begins on Wednesday night at home against Manchester, who became the first AHL team to clinch a playoff spot on Saturday. Friday Albany travels east to Springfield for the final matchup of the season against the Falcons. Then Saturday Binghamton comes to visit, and it’s also the annual Military Appreciation Day at the arena. Pop Quiz Answer: Since Norfolk entered the American Hockey League for the 2000-01 season, the River Rats and Devils have an all time record of 16-19-3-4 and one tie. It took 9 tries for Albany to finally get a win at the Scope, on April 8, 2005, a 4-1 River Rat win. Note: No photo gallery this week. -Albany begins the week with a 29-25-5-6 mark, good for 69 points and 4th place in the Northeast Division, 6 points behind third place Springfield. That is also the same number of points they sit behind the Falcons for the 8th and final playoff spot in the East. They are 5 points behind 9th place Worcester and tied with 11th place St. John’s for points. 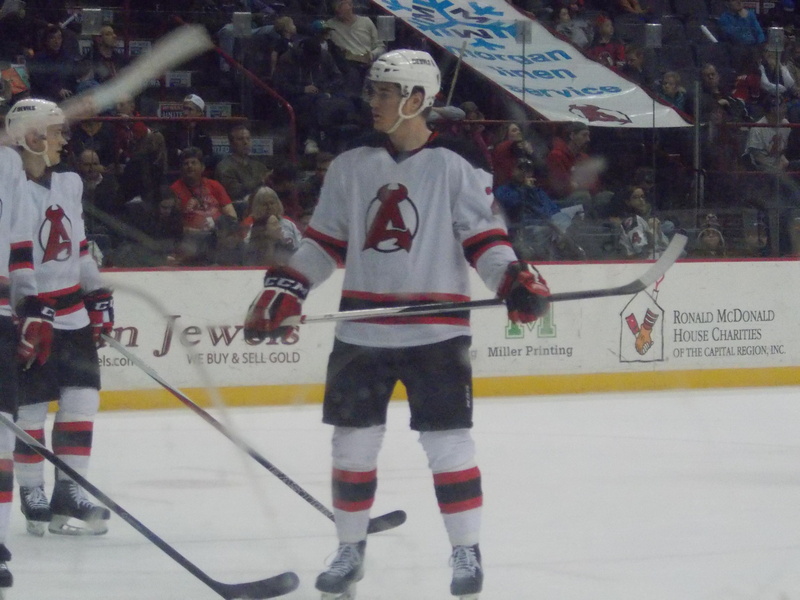 -For the second time this season, Albany is hitting the road minus Cam Janssen. On Tuesday, he was given a 2 game suspension by the AHL for a “interference incident” in Sunday’s game against Hartford (guessing by process of elimination it happened here). -Kelly Zajac has officially been shut down for the season due to a nagging lower body injury. -With two forwards out and Reece Scarlett recovering from the flu, Alexandre Carrier and Mike Keenan have been recalled from Orlando. Where: Norfolk Scope, Norfolk, VA. When: 7:30 PM 3/27, 7:15 PM 3/28. -Norfolk finished a 1-6 road swing (the only win being the 1-0 victory in Albany on Wednesday) and comes home for a six game homestand, starting with a loss to the Checkers on Wednesday. They will only have one more home game as an AHL team, on April 17th against Lehigh Valley before finishing the year in Wilkes-Barre on the 18th. -With a 3-2 loss to Charlotte on Wednesday, the Admirals are officially eliminated from Calder Cup contention, the first Eastern team to be out and the second in the league (Iowa was officially eliminated over the weekend). -Norfolk will be without its lone All Star and one of its leading scorers Chris Wagner, who was recalled to Anaheim on Sunday. Don’t count the Devils out just yet. After a slow start to the week, the team has got their offensive touch back, taking two out of three wins on the week and staying in the race for the final playoff spot. Game #4 of the homestand came Wednesday, as Albany hosted the Admirals for the first time all season. And much like Sunday, it was another struggle on both sides to get a goal. 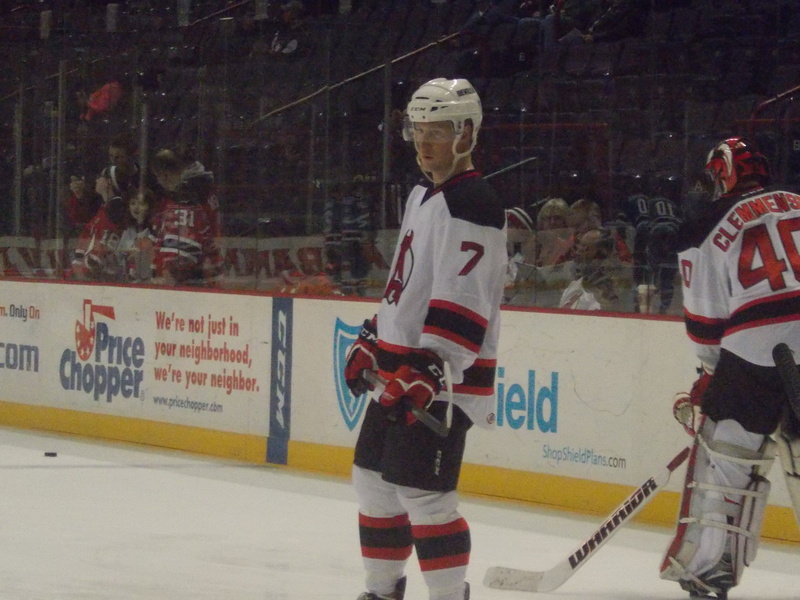 The Devils did outshoot Norfolk 14-7 in the first, but couldn’t get anything into the net. Second period was more of the same defensive struggle, with the only action being two fights breaking out within 1:24 of each other. But with 3:06 to go in the period, Norfolk struck first, or did they? About 3 Ads were surrounding Scott Clemmensen’s net, and one of them was able to bat the puck in behind him. It looked like goaltender interference, so the referees went to the video…and it was called a good goal (of course they did). Stefan Noesen was given credit for the tally. Albany had a golden opportunity to tie things up with a late period/early third period 5 on 3 opportunity, but could not get the job done. Two more power play opportunities and an empty net situation followed, but still no offense. And the Devils were shutout for a second straight game, extending the scoreless drought to 125 minutes and 3 seconds. Clemmensen played outstanding in the loss, stopping 25 of 26 shots. Friday: The second ATO of the season has arrived–and the Devils didn’t have to go very far to find him. Union College forward Max Novak, a native of New Jersey, becomes the third UC alum to suit up for the Devils (Keith Kinkaid and Kelly Zajac the other two). In 35 games this season, he notched 28 points (10 goals, 18 assists) and had a +3 rating. His most memorable goal came last season, as he scored the game winner in Union’s 7-4 national championship win over Minnesota in Philadelphia. For his four year career, he has a total of 96 points (43 goals, 53 assists) in 141 games. Saturday: With Mike Cammalleri out due to the flu and Patrik Elias suffering from back spasms, both Reid Boucher and Stefan Matteau were recalled under emergency conditions to New Jersey…only to both be scratched for the Devils 3-0 shutout loss to the Islanders. They were both returned to Albany then recalled under regular conditions. After Norfolk made a quick journey west to Binghamton on Friday (and lost 4-3 to the Senators), it was back to the Capital Region on Saturday for the rematch. And finally, the Devils sleeping offense came to life. Brandon Burlon finally broke Albany’s long scoreless drought early in the first period with his sixth goal of the season for a 1-0 lead. It was the first goal for Albany in a span of 127 minutes and 40 seconds. 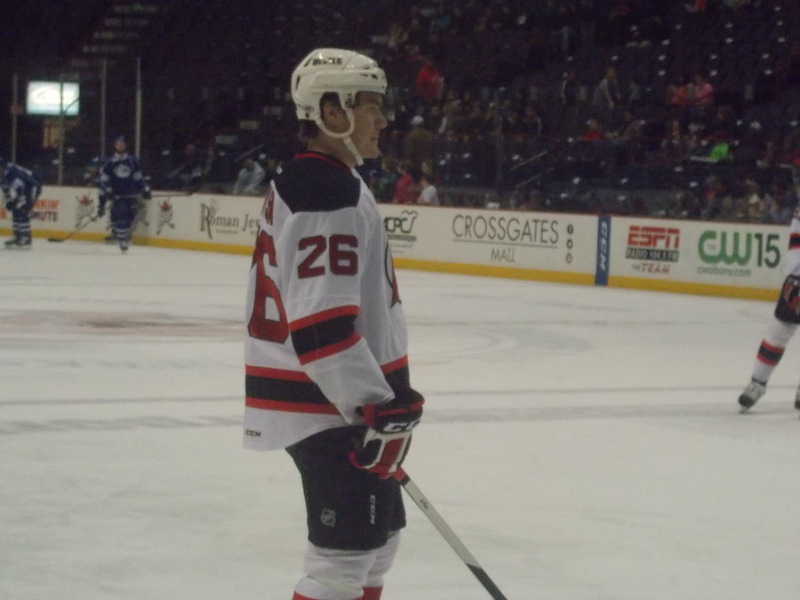 But Chris Wagner would tie it up midway through the period with a power play goal. Then the Devils were forced to play shorthanded yet again as Dan Kelly took a 5 minute major and game misconduct for boarding Norfolk’s Mike Sgarbossa…but Wagner was called for roughing (and also fighting Kelly) on the same incident, creating a 4 on 3/4 on 4/Norfolk major power play situation. And they would capitalize on that, taking a 2-1 lead on a Jaycob Megna goal. The Devils would kill off the rest and mount a rally in the second period. Raman Hrabarenka (6th) and Chris McKelvie (3rd) would score 3:04 apart midway through for a 3-2 Devil lead. But John Kurtz would re-tie the game up just before the second ended. The game remained deadlocked late…until another long drought was broken. 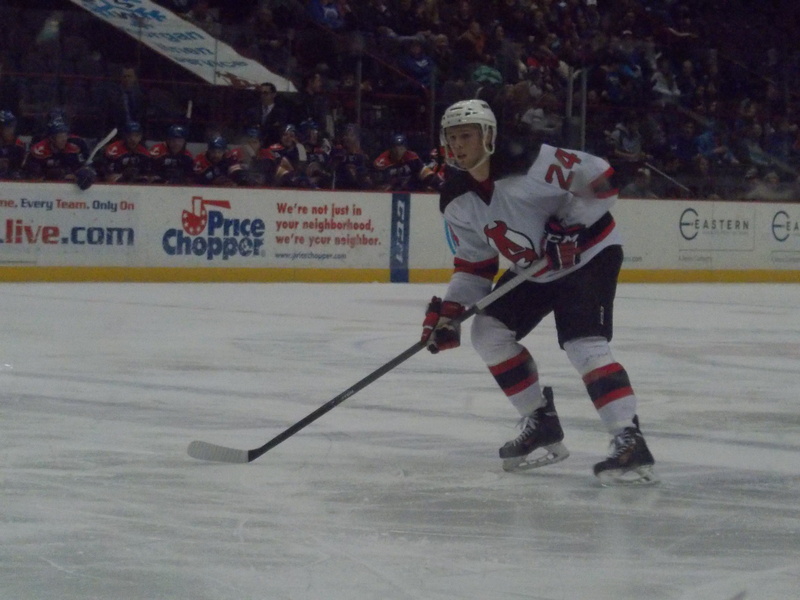 Matt Lorito, finally making his pro debut, scored on a power play with 5:21 remaining in regulation to put the Devils ahead 4-3. It was their first power play goal since March 1st, snapping an 0-for-27 drought. Albany survived an extra attacker late and held on for the win, breaking a 3 game winless skid and jumping from 12th to 10th in the Eastern Conference standings. Scott Wedgewood picked up win #10, stopping 24 of 27 shots. 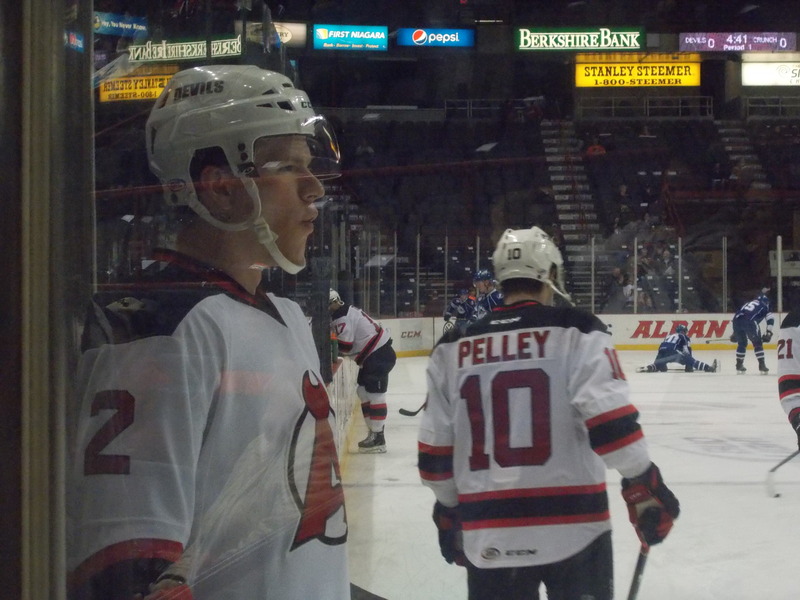 It was a balanced offensive attack for the Devils on this day: Burlon and Graham Black added two assists, while McKelvie, Hrabarenka, Seth Helgeson, and Rod Pelley each had helpers. Sunday: As a result of his major/game misconduct penalty on Saturday, Dan Kelly was given a one game suspension and had to sit out Sunday’s home game against Hartford. 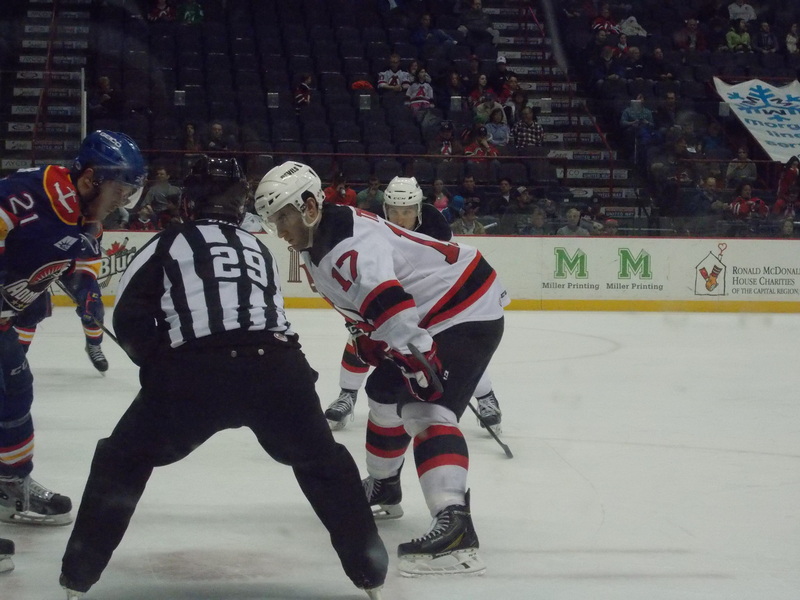 The long homestand finally came to an end on Sunday afternoon, as the Devils played host to the Wolfpack. After a physical start, the visitors got on the board late in the first on a very lucky bounce off the stick of Joey Crabb for a 1-0 lead. 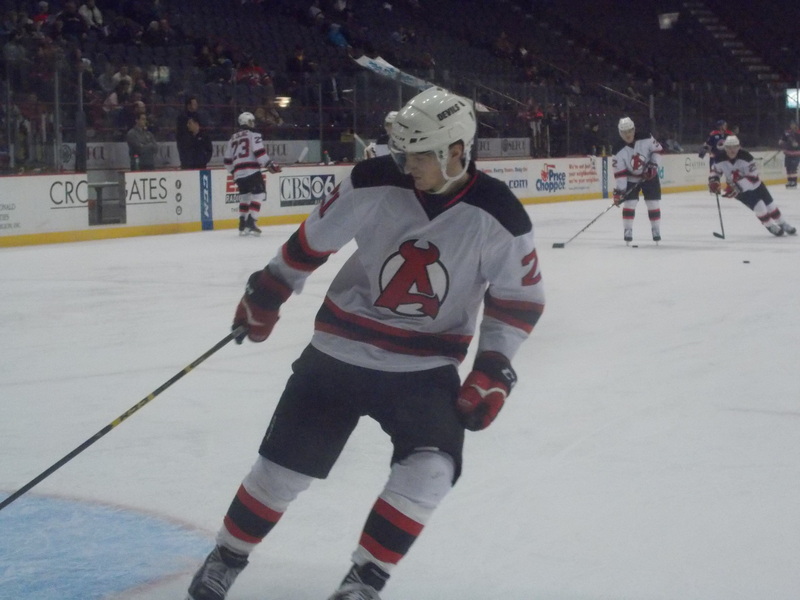 Carl Klingberg would double the lead late in the second period, and the way things were going for Albany it looked like another blow to their fading playoff hopes. But then the third period happened. Paul Thompson would get Albany on the board just 1:02 in with a power play tally (yes another one! ), then exactly one minute later Mike Sislo would tie it up. On another power play opportunity later, Scott Timmins would put the Devils ahead with his 8th goal. Just 1:04 later, Raman Hrabarenka would add another power play goal for a 4-2 lead. Oscar Lindberg would make things interesting late with a goal to put Hartford within one, but Tim Sestito would finish it off with an empty netter. Lost in the comeback and tying a franchise record with 5 goals in a period was another good outing from Scott Clemmensen, who only needed to stop 15 of 18 shots to pick up the win. 10 Devil skaters had at least one point, with Sislo’s one goal/two assist performance leading the way. The magic number to clinch stands at 32, while the tragic number is 17. Pop Quiz: It’s a 2 part question this week. Who holds the Albany AHL record for the best plus/minus rating for one season? And who has the worst? Both answers are coming up. Not long after that, it was Chris McKelvie’s turn in the ring, so to speak. The last two days have given quite a few candidates to choose from, so this week it’s being split. Good to see Chris McKelvie break out with a goal and two assists, and both Brandon Burlon and Raman Hrabarenka had good offensive showings from the blue line. Honorable mention to Matt Lorito for producing the game winner in his pro debut, hopefully the first of many goals to come. Maxime Clermont (Orlando): 18 GP, 9-6-0, 2.96 GAA, .900 Save Pct. Injury Update: The only questions right now are the brothers Zajac, as Kelly is still nursing a nagging lower body injury. Darcy sat out Sunday’s win and was the only player not in attendance for the team postgame autograph session, so not sure of his status. This Week’s Schedule: A quick two game schedule for the Devils this week. Just a ten hour bus ride to Norfolk awaits them, that’s all. Friday and Saturday evening they close out their March slate by making their last trip ever to Virginia to take on the Admirals. And if the two games this week were any indication…buckle up boys and girls. Pop Quiz Answer: This week we’re looking at plus/minus ratings in Albany history. The best belongs to Scott Pellerin, who was a +43 for the 1995-96 River Rats. The worst is actually a tie: Jiri Bicek and Joel Bouchard both finished a -30 for the 2001-02 River Rats. -Albany begins this week with a record of 27-24-5-6 and 65 points. They stand in 4th place in the Northeast Division (8 points behind 3rd place Springfield) and 12th place in the Eastern Conference (tied with Lehigh Valley for 11th, 1 point behind 10th place St. John’s). -Alexandre Carrier was reassigned to Orlando on Monday after not making an appearance since his recall on March 4th. -On Tuesday, Joe Whitney was given a 2 game suspension as a result of his match penalty on Saturday against Syracuse. He served the first game on Sunday and will only have to sit out today’s matchup. When: 7:00 PM 3/18, 5:00 PM 3/21. -It has not been a great season for the Admirals, who have seen a total of 49 different players dress for at least one game, including 6 goaltenders. -Norfolk is in the middle of a seven game road trip, and have yet to see the win column, losing to Charlotte, Portland twice, and Providence. They will make a quick trip west to Binghamton on Friday evening before coming back to Albany for Saturday afternoon. They have not won since a 3-2 victory over Bridgeport on February 22nd. -This is the last time Norfolk will visit the Capital Region, as they will be returning to the ECHL next season as Edmonton’s affiliate. The AHL Ducks will be relocating to San Diego and become the Gulls. -A special for Saturday, as it is Devils Fight Cancer Night. There is a special $18 ticket special, with $5 from each ticket going to the Melodies Center. There are also $10 autographed pucks available with all proceeds also going to the Melodies Center. Season Series: Hartford leads 5-2. -Hartford has been on a roller coaster during the past month, dropping 6 in a row (with one in overtime) before sweeping last weekend on the road. They have jumped to second place in the division, just six points behind first place Syracuse. -The Wolfpack are about to start their third straight 3 in 3 weekend, hosting Lehigh Valley on Friday and traveling to Springfield on Saturday before finishing the weekend in Albany. -The second and final post game autograph session of the season follows Sunday’s contest. It’s also Team Poster Day. After a good trip to Newfoundland, Albany started a season long six game homestand with a 3 in 3 weekend against teams all in the playoff picture, hoping to scrape away at their deficit to get back into the playoff picture. But three goals and three out of six points later…nothing much gained. And time is starting to run out. Friday: Much earlier than I expected, but the first amateur tryout of the season has arrived, in the form of Brown University forward Matt Lorito. He just completed his senior season with the Bears, scoring 11 goals and 12 assists in 23 games while serving as team captain. For his four year collegiate career, he has a total of 106 points (47 goals, 59 assists). He was also a 2014 New Jersey rookie camp invitee. The homestand kicked off Friday evening with a visit from the Sharks, who began the evening just inside the playoff picture. Albany got off to a great start in the first period, not allowing a shot on goal for nearly 9 minutes and taking a 1-0 lead on Paul Thompson’s 25th goal of the season. Captain Rod Pelley would double the lead just after a power play opportunity ended. But Worcester would mount a rally in the second period. Just as their third power play would expire, Taylor Fedun cut the lead in half. Later in the period, during a 4 on 4 opportunity that should not have been (what many in house thought was a dive was called a tripping penalty on Joe Whitney), Karl Stollery would tie the game up at 2. But Albany took the lead back for good in the third thanks to Darcy Zajac’s 7th goal of the season, picking up their second straight win and extending their March point streak to 3 games. Yes, it took just 3 games for Albany to match their entire win total for the month of February. Scott Clemmensen played well in net, stopping 27 of 29 shots (you could probably credit 2 or 3 of those to Raman Hrabarenka, he was swatting pucks near the crease away quite a bit) and picking up win #6. 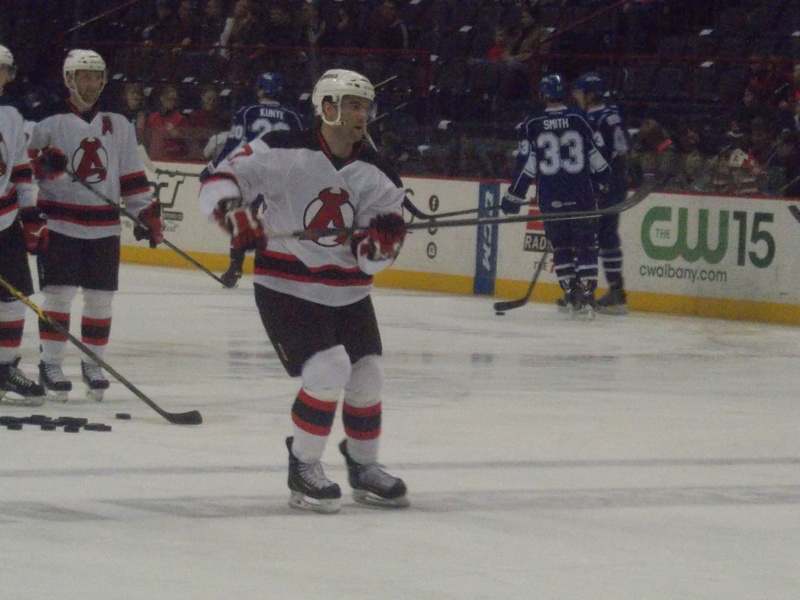 Zajac and Pelley also added assists, and Tim Sestito and Corbin McPherson had one helper each. 21 hours later, Albany was back on ice, this time taking on the first place Crunch. It appeared the Devils would get a break when former RPI goaltender Allen York drew the start instead of Kristers Gudlevskis (the Crunch are in the midst of a 3 in 3 weekend of their own). After a relatively quiet first period, things would shift in favor of the Crunch in a big way in the second period. Joe Whitney was called for a match penalty for cross checking Syracuse’s Luke Witkowski (I had my complaints about the call, but honestly from my angle in the corner it was hard to see the actual incident), giving the visitors a 5 minute power play. And they would capitalize just 30 seconds in, as Jonathan Marchessault would score to break up the scoreless duel between York and Scott Wedgewood. Albany just could not seem to get any breaks offensively, seeing at least 3 good scoring chances just miss the net or hit off the post. Carter Ashton would score an empty netter with 18 seconds remaining to seal the win…and it was very fortunate that happened, because Raman Hrabarenka would break up York’s shutout bid with just 3.6 seconds left on the clock. But it came too little, too late, as Syracuse won it’s 6th out of 7 matchups against Albany this season. Wedgewood played very well in the loss, stopping 21 of 22. David Wohlberg and Ben Thomson had the lone assists. Without Whitney in the lineup due to automatic suspension from Saturday’s penalty, the Devils had to shake up the lines for their final game of the weekend against the Falcons, who began the day holding the 8th and final playoff spot in the East. Kelly Zajac returned and was back on second line duty, while Chris McKelvie made his first appearance of the weekend, going in for Ben Thomson. And even Joe Faust made an appearance, going in for Brandon Burlon. Other than another mini scrum, nothing across in the first, as Albany outshot the visitors 11-4. The Falcons woke up in the second and had 15 shots, but Scott Wedgewood stopped all of them. The only thing stopping anyone? A glass delay. More scoreless hockey in the third, including some very good saves from Wedgewood. 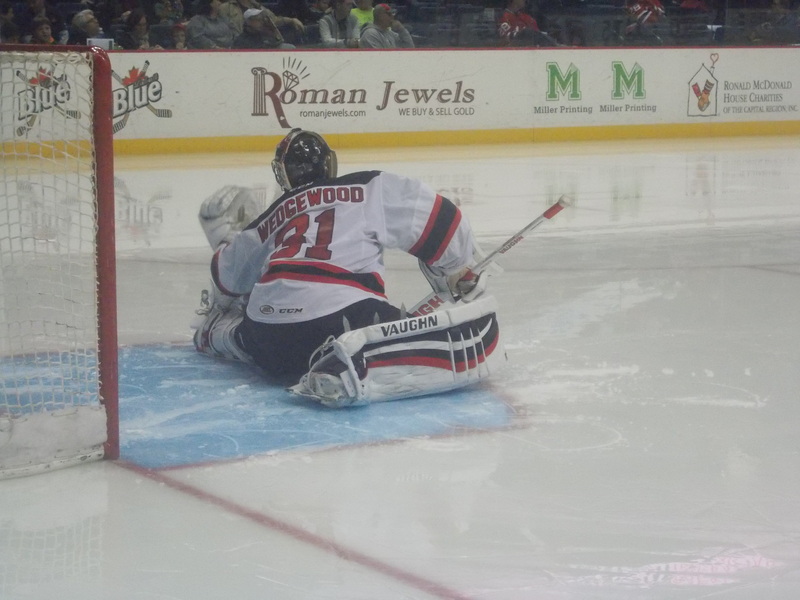 But despite 14 shots, the Devils could not get anything at all past Falcons goaltender Scott Munroe. It was on to overtime, where Reid Boucher and Stefan Matteau had good shots at ending things, but still, nothing was getting by Munroe. So finally things went to a shootout, where someone had to score to finish this epic goaltending duel. Unfortunately only two Falcons, T.J. Tynan and Sean Collins were able to get the puck in net. Paul Thompson and Mike Sislo had their chances, but couldn’t get the puck in, and Springfield earned the extra point. It was the Devils sixth shootout loss and the sixth shutout of the season. Wedgewood was the very hard luck but deserved much better loser in net, stopping all 33 shots in 65 minutes, but couldn’t finish it in the bonus round. The magic number to clinch a postseason spot stands at 38, while the tragic number now sits at 24. Again, this is if I did the math right. Pop Quiz: Who holds the Albany AHL record for most wins in a season? The answer is coming up. Well…since no video has surfaced as of yet from Sunday’s festivities…let’s go to the Devils vault. Found this classic double feature from 5 years ago. Maxime Clermont (Orlando): 17 GP, 8-5-0, 2.78 GAA, .904 Save Pct. Injury Update: Since there’s no injuries to report…this will be more like a suspension update. Cam Janssen finished serving his sentence on Sunday and is eligible to return on Wednesday. Joe Whitney served one game after getting a match penalty on Saturday, but it is yet to be determined if he will have to sit out any longer. This Week’s Schedule: The homestand continues with 3 more games. 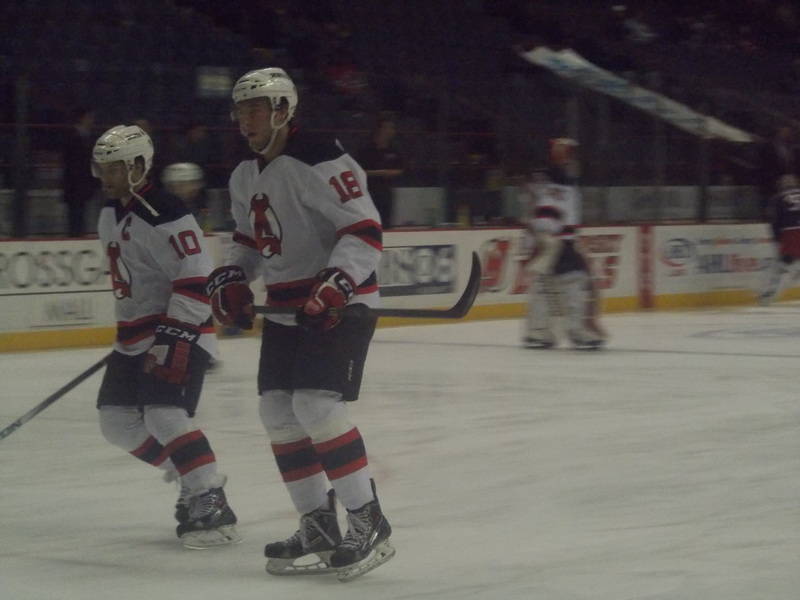 Wednesday and Saturday the Devils play host to Norfolk, the last opponent Albany has yet to face this season. Then Sunday afternoon they take on Hartford. Pop Quiz Answer: The Albany goalie with the most wins in one season? It was Peter Sidorkiewicz, who went 31-23-6 in 62 games played during the 1996-97 season.